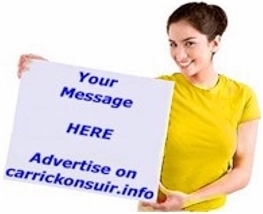 Welcome to carrickonsuir.info - the official website and business directory for the town of Carrick-on-Suir. The objective of this website is to serve as a useful resource for the people of Carrick-on-Suir and visitors alike. With this new interactive site, every organisation and business in Carrick-on-Suir can have a presence which they can easily update themselves. It will help build a salubrious image to our town by creating awareness of the potential that Carrick-on-Suir has to offer. Many features of the previous version of this website have been retained. However, this new version is optimised for mobile viewing. A valuable new feature is the ability to Improve Carrick by creating awareness of issues existing in the town that are problematic. To help implement the above and ensure sustainability of this website, Carrickonsuir.info now seeks to negotiate and partner with official sponsors. This would ensure the constant maintenance and future development of this website while also provide marketing, advertising and PR opportunities for the would-be sponsors. We value feedback. Therefore, if you would like to see some new feature on this site, please let us know via our contact form. Finally, if you enjoyed this website, please sign the Carrick-on-Suir Guestbook or kindly show your appreciation by supporting the maintenance costs with our Donate facility.